A recreational ice skating rink is a symbol for conviviality, livening things up and connecting young and old. A portable ice skating rink is a crowd-puller and ensures that visitors stay longer at your event or permanent ice skating rink. A portable ice skating rink from Ice-World is up to as much as 40% more energy efficient than other ice skating rink systems. The ice skating rink elements are designed in such a way that we can set up an ice skating rink with real ice in any desired size, in any conceivable location and in any weather conditions. For example, a permanent crowd-puller in Istanbul or skating on an iconic square in Düsseldorf. Our range of accessories such as skates for rent, curling stones, ice maintenance equipment and exclusive skating aids ensures that we, together with our local partners, take the best care of you. The quality of the skating rink is however not the only condition for a successful ice event. The success of a project depends on many factors, such as a good concept, tight project management and excellent supervision in all phases of the project. We advise you about everything that is involved in the organisation of the ice event: from permit to insurance, from budgeting to sponsorship and from accessories to ticket sales. Thanks to our 25 years of experience, Ice-World is your partner of choice for a successful ice event. Are you curious about the advantages of renting or buying a portable ice skating rink for your location or event? Please contact us or one of our local partners to discuss the opportunities. We had an ice skating rink for the first time in 50 years. Visitors to our ice skating rink event: children, families and couples enjoyed the skating rink and that made our event very successful. That’s why we decided to install another Ice-World ice skating rink for next winter. 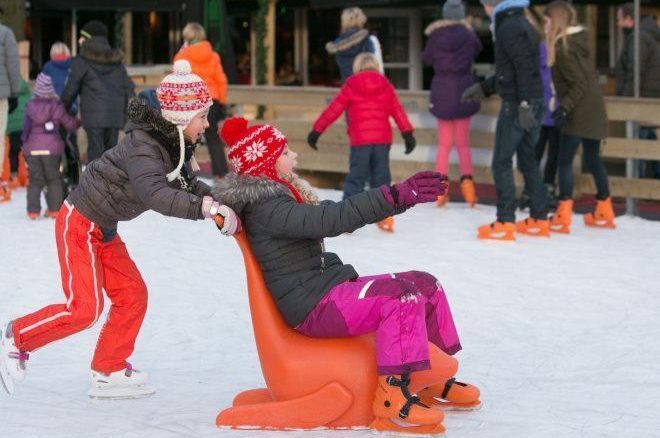 The spectacular IceByk® is ideal for school groups, business events and families. The Icebyk can be used individually or for group activities, games and competitions. Get to know the fun ice-skating aid Tommy the Reindeer®: the ideal skating aid for learning to skate independently. Countless rink layout variations thanks to the Base®. For example, create a kids’ play area, an ice rink centre piece with benches and a Christmas tree or a photo point. Our skating aid Bobby the Seal® is world famous: the skating aid to learn how to skate and sometimes just to take a rest and a ride on its back. XXL fun on ice for skaters and non-skaters! Our spectacular mini amusement parks with real ice slides are popular in shopping malls, stadiums and theme parks.